Every spring I plant fresh basil in my herb garden so I can enjoy a summer of pesto sauces over my pasta dishes. 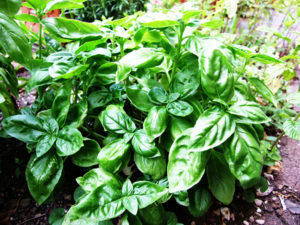 Sweet basil is an easy herb to grow in this climate and has many uses, not only in cooking, but therapeutic as well. Originally grown around the Mediterranean, ocimum basilicum, is steam distilled to make the essential oil. It was considered the oil of the kings (basileum means king and this herb was used in anointing kings throughout history). Its therapeutic properties are as an antidepressant, antiseptic, antispasmodic, digestive, expectorant, nervine and tonic. For respiratory complaints, basil helps sinus congestion, chest infections, bronchitis, colds and flu. It can be rubbed onto the chest in a little massage oil or used in an inhaler. Its antiseptic qualities make it a great oil to burn in an aroma lamp during illness to stop the spread of infection. It calms asthma and coughs and opens the chest for freer flow of breath. Basil has diuretic properties and increases movement in stagnant eliminatory channels. It encourages menstrual flow and aids in painful or scanty periods. Basil should be avoided by pregnant women because it increases cleansing of the uterus by expelling sluggish blood flow. Basil should also not be overused since it is a strong diuretic and can tax the urogenital system. Basil is reputed to stimulate hair growth and increase vitality and blood circulation to the hair. Massaged into the scalp in a little jojoba oil, this wonderful essential oil tingles the scalp and cleanses clogged, tired hair follicles so that strong thick hair can escape. Great for the skin, basil clears congested skin and works well to alleviate the pain and discomfort of herpes and shingles. It is considered good for bee stings as it draws the poisons out. Because basil is such a stimulating and uplifting oil, it is widely used in massage oils for atheletes and dancers, as it relieves the burning and tiredness of overworked muscles. It clears the acid that builds up in the muscle structures to be released into the eliminatory system. It tonifies the nervous system and allows relaxation without exhaustion. Although considered to be a yang oil, basil has been used in rituals to honor the goddess. It is said that basil is ruled by Scorpio and thus has a strong emotional nature, allowing for powerful feelings to emerge. It also encourages a strong sense of purpose, which combined with mental alertness and clarity, really makes this a dynamic oil when desiring to achieve something. So when you are planting your herb garden, leave a little room for this king of kings plant and enjoy all it has to offer!